Chhattisgarh:BJP MLA Bhima Mandavi and four security personnel were Tuesday killed when their convoy was attacked by Naxalites in Chhattisgarh’s Dantewada district, days before the first-phase elections in the state, police said. The incident occurred at Shyamagiri hills when the MLA’s convoy was heading towards Kuwakonda from Bacheli area, which is about 450 km from state capital Raipur.The Naxalites blew up a vehicle in the convoy with an IED and opened fire at the occupants. The MLA and four security personnel were killed in the attack, police officials said. Security forces have been rushed to the area, they said. The attack is reminiscent of a similar incident that took place in the Naxal hotbed of Bastar ahead of the assembly elections in May 2013. Twenty-seven people, including senior Congress leader Mahendra Karma and former Union minister V C Shukla, were killed in the ambush. 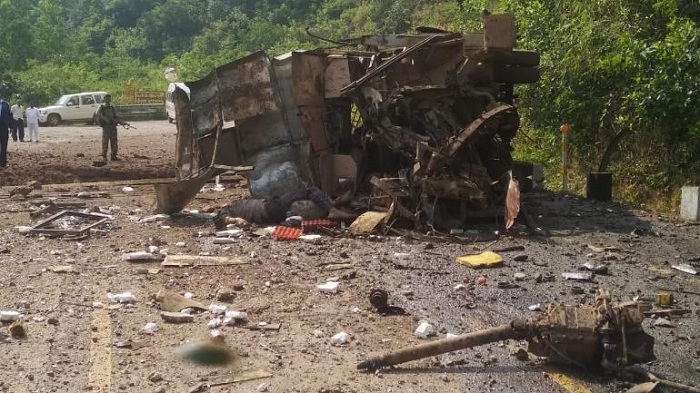 Before the assembly elections in November last year, a CISF personnel and three civilians were killed in Dantewada when an improvised explosive device planted by Naxalites tore through a bus. Dantewada falls in the Bastar Lok Sabha seat which will go to polls in the first phase on April 11.